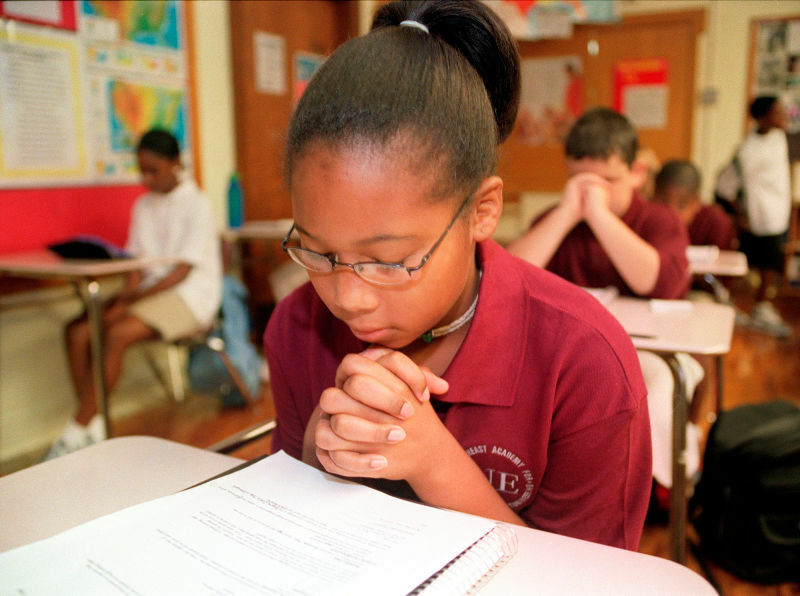 A key committee in Alabama's House of Representatives has pushed through a bill requiring teachers and students at all of the state's public schools to spend 15 minutes every morning in Christian prayer, even though a majority of legislators present say they opposed the measure. Alabama, of course, is a churchin' state, ranked the "2nd most religious state" behind its neighbor, Mississippi. Alabama is also home to Roy Moore, the state Supreme Court chief justice who fought to keep a massive stone sculpture of the Ten Commandments in the state court building. The bill, sponsored by Rep. Steve Hurst, R-Munford, would require teachers to spend no more than 15 minutes in the first class of each day to read, verbatim, opening prayers said before a meeting of the U.S. House of Representatives or the U.S. Senate. Rep. Mary Sue McClurkin, R-Indian Springs, chairwoman of the committee, said she heard more votes in favor of the bill. "It's what I heard as chairman," she said. Only McClurkin and one other Republican on the panel actually voted "aye" on the bill. Two Republicans and one Democrat insist they said "no" to the bill in the voice vote; three legislators weren't even present for the vote. The House's clerk told the Advertiser that "the chairman of each committee has the discretion to decide the outcome of a voice vote." McClurkin also voice-voted through a bill "that would allow students to initiate prayer in school and express their religious views in their schoolwork." The sponsor of that bill told the Advertiser: "Every bit of this bill is already legal. It's just that no one knows it's legal."